Welcome to the world famous French restaurant. Denise’s Restaurant is ideally located between Holborn and Bloomsbury and brings you the ambience of a classy French restaurant with an authentic French cuisine. The restaurant is cozy at lunch and intimate at dinner. There is an enticing terrace with a few tables outside where you can dine well en plein air. The food here is simply irresistible. The fabulous French menu offers an array of mouth watering healthy fresh food. This is prepared to perfection by the gifted hands of their master chef. Try their traditional poultry dishes or if your feeling adventurous why not try the Dover Sole or See bass it will probably be the best fish you have eaten in London. Steak lovers are not forgotten at Denise’s and are in for a real treat. The wide range of tasty desserts are a must try. The wine list has been carefully chosen to complement the robust cooking and the service feels personal and helpful. A very nice dining experience Indeed! Being one of the longest established French restaurants in this area (etablished in 1989 and is still in the same hands), Denise's Restaurant has been a favourite gathering place for groups of friends, colleagues or business meetings. With its central Location and traditional French dishes such as frog legs and escargot you are guaranteed to be well catered for! 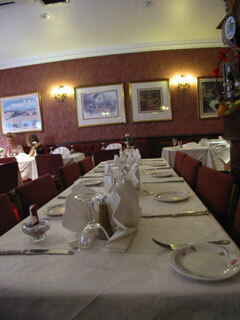 Denises's restaurant can cater for private parties of up to 52 people. 10% discount between 12 noon and 5 pm. An array of mouth watering healthy fresh French food cooked to perfection and complemented by a carefully selected wine list. In the complictaed world we live in, it's good to find simple solutions.